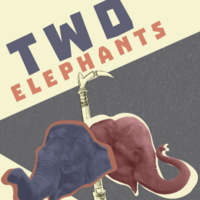 "Two Elephants" is a documentary written, directed, and produced by Erin Gibson, USI instructor of journalism and student publications advisor. The film will be followed by a Q&A. When Kay the elephant arrived at Mesker Park Zoo in 1929, the city of Evansville celebrated with a parade. Tragedy struck 25 years later, and the city labeled her a killer, traded her and forgot her. The film will make its first film festival appearance at the YES Film Festival in Columbus, Indiana, in October. It has also received a 2018 Storytelling Award from A Show for a Change. Production was supported by a USI College of Liberal Arts Faculty Development Award. Very interesting movie, amazing to be able to research and find so much information. Really like the use of the cartoons of Kay to show her life, much like the Indian art of story telling called Katha. Love stories about Elephants, and importance of Elephant handlers. thank you..